"Teamwork is the quintessential contradiction of a society grounded in individual achievement." 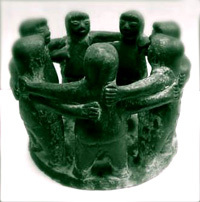 in the moment people become conscious of their shared responsibilities as part of a group and begin to feel the group's potentials as a team. But it really gets off the ground when members decide together to activate those combined potentials. That is what happens when a group begins to look toward +1 and +2 trust levels. Prior to that point, teams operate either somewhat unconsciously. Consciousness of the team can create a strong sense of identity and direction for a group in ways that generate synergy -- outcomes that are more than the sum of individual contributions. In traditional hierarchies people often assume that group potentials can be maximized by commanding individuals to each perform their separate roles in an exceptional manner. This is the theory of clear, specialized roles and responsibilities and an individualistic work ethic. Thinking within this framework, most workplace problems seem to be the result of unclear or unmet accountabilities. When there is success, it appears as the result of individual achievement, the product of star performers. And when problems occur, the flipside assumption applies: there is someone not doing his or her job and therefore to blame. However, most work by its nature is an interactive and interdependent process. No set of job descriptions listing the duties of individuals nor any collection of individual goal statements will ever capture an organization's full complexity. No matter how well organized or documented, in the end our communications, shared thinking, and relationships with each other -- and that means our level of trust -- deeply matter. As our organizations become flatter and more networked, more dependent on groups and how well team members communicate and innovate together, the need for trust-based workplaces will only increase. While trust is not the only component of effective organizational cultures, it is an especially crucial one. • People do not share essential knowledge. • They hide their mistakes. • They withdraw their effort and do not solve their problems. • They become defensive, and intolerant. Like other forms of waste, mistrust ultimately represents an unaffordable, and sometimes tragic, misallocation of energy. • People tap one another's talents freely. • They assist when help is needed. • They challenge and support one another to grow. • They share rather than isolate resources. • They find ways to overcome obstacles that are daunting to the individuals who might face them alone. While trust is not the same as "psychological safety," in a practical sense it probably shares many of the same benefits. Amy C. Edmondson, Novartis Professor of Leadership and Management at Harvard Business School, has repeatedly shown that teams where people "felt free to be themselves" learned and adapted to change many times faster than teams that felt unsafe. • Many groups spend little time in deliberate and intentional development of individuals within a team environment or of the team as a whole. • For all the lipservice given to teams and the value of teamwork, little is often learned from teams that are especially high- or low-performing. * Despite cynical or worried voices, there is also underlying energy for growth, development and making the most of human potentials. • Teams operate as small communities: their dynamics reflect the broader culture of the organization in which they reside but they also have their own unique characteristics. • Team culture often reflects the style and skill of those who lead, formally or informally. The survey's five levels were defined intuitively and as the result of consulting experiences. There is no particular magic in the breakdown, and there might be many other ways to organize experience and perception. 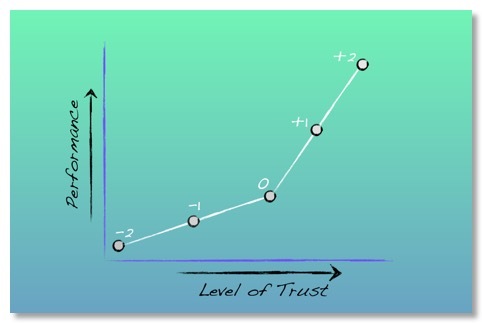 The notion that most teams operate in a range above dysfunctional but below their potential is a way to acknowledge that a "bell" or "average" distribution in trust and performance is both likely...and uncomfortable. We all like to assume that we are in the upper third or higher, no matter what the arena of achievement, much as Garrison Keillor's version of the fictitious town of Lake Wobegon is one where "all the children are above average." The breakthrough is in the understanding that no matter where we are on the scale we have not actualized all our potentials yet. These are tough challenges, yet they are our teachers, the result of individualistic and hierarchical conditioning. The present world, intricately interwoven, risky, and much smaller than in the past demands that we learn the trade of trust-building lest our organizations and societies falter. Thriving in the future now really is predicated on our capacity to work as communities, local and global. In that effort the one skill that stands behind all our challenges is truly "seeing one another." We must be able to recognize the hidden potentials in each other, so that we can help call forth those potentials together. The truth is we need each other in order to become who we truly are as people and accomplish what is needed as part of an enterprise.